DREGstudios! The Artwork of Brandt Hardin: Happy 65th Birthday Tim Curry! Happy 65th Birthday Tim Curry! Click HERE To Order a Print! Tim Curry's breakthrough role in show business was penned by Richard O'brien with Rocky Horror Picture Show . The two actors met on the stage as members of the original production of Hair in London. 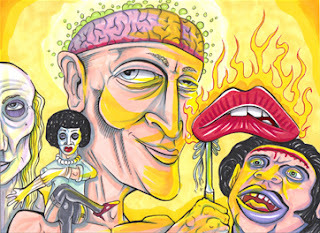 This first portrait from my Cult of Personality series includes the character of Dr. Frank N. Furter (Curry) along with others including O'brien himself. My personal favorite part of the work was getting to draw Meatloaf as his incarnation of Eddie the Ex-Delivery Boy. I've always had a vivid imagination and loved activities which allowed me to flex my imagination such as reading books which take me places I'd not normally go. Stephen King has painted these worlds for me since the 7th Grade, when I first picked up The Dark Tower series. In my Sophomore year of High School, the English teacher didn't believe I read IT all the way through. One of King's longest novels, it came in at just under 1,100 pages in my paperback version. My hands were cramped from holding it for the three straight weeks I pounded through it. IT went on to be made into a television miniseries also starring Tim Curry as Pennywise the Dancing Clown, one of King's most warped and disturbed characters. Pennywise lives in the sewer and rips a boy's arm off within the first twenty pages of this epic which spans a lifetime for the characters involved. I read it before seeing the miniseries and Curry definitely added a whole new level to the character's sick humor. 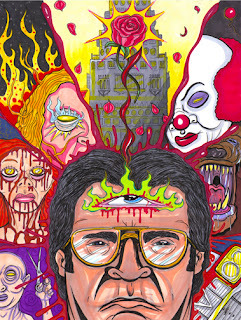 Pennywise can be found here in my portrait of the author along with more of King's creations including The Dark Tower itself. There are some roles out there that only Tim Curry could have ever played including that of Darkness (An incarnation of Satan from Ridley Scott's Legend in 1985. The actor finally won his sole Emmy in 1990 for being the voice of Capatin Hook in a made-for-TV animated Peter Pan and The Pirates which followed the story of the original book by J.M. Barie. This was Curry's first real venture into voice acting and has now done dozens of movies and television productions. Click HERE for more of my Cult of Personality series!